Jadis Tillery was worried about her waistline in the run-up to her wedding last March. ‘I have diabetes in my family, so I’ve always been aware of the need to stay trim,’ explains the 32-year-old marketing executive from London. Then she learned about a novel new weekly diet plan – which involved cutting her calories to just 1,000 a day for three days, then increasing them to 1,500 for the remaining four. (The normal recommended daily intake for a woman is 2,000). The results, she says, were ‘amazing’. Not only did she rarely suffer hunger pangs (‘For the last four days I was eating 1,500 calories and having two delicious meals a day, but by the end of the week I was finding it hard to finish them’), but she had loads more energy. Even more pleasing were the physical results. This meant her total weight loss on the scales was 4lb, but her body composition had changed so she was leaner. (This was calculated by measuring her body fat with calipers before and after and then comparing that with the weight lost). This is not the kind of effect you’d expect from cutting calories alone (and even then, you wouldn’t expect such a loss of weight). So what was going on? The secret lies in what Jadis was actually eating. Her diet was packed with foods that are naturally rich in chemical compounds that experts now believe are crucial for burning fat, reducing appetite and boosting health. These chemicals are thought to directly affect a group of ‘housekeeping’ genes in the body called sirtuins. These genes control the way our bodies handle fat and sugar. Sirtuin genes spring into action when we feel mildly stressed. Cutting back on your calories for a day or so can trigger them – this might help explain why the 5:2 diet (where you eat very little for two days a week, and then eat normally on the other five days) helps people lose weight. The physical stress of exercising also triggers sirtuins. But scientists have only recently found that potent chemical compounds known as sirtuin activators, found naturally in fruit and vegetables, can do the same thing. 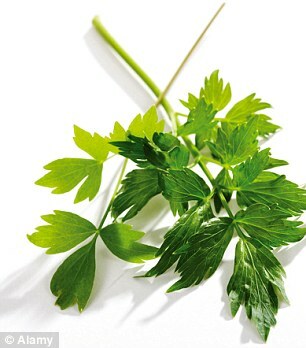 Foods that contain high levels of them are known as ‘sirtfoods’. Examples include olives and extra-virgin olive oil, onions, kale, parsley, loveage (a herb in the parsley family), blackcurrants, miso soup, tofu and other soy products, capers, cocoa and green tea. By making these foods the centre of her eating plan, Jadis was in effect turbo-charging the effects of cutting down on calories, which was why she could eat more for part of the week but still lose weight. There is growing evidence that sirtuin activators may have a wide range of health benefits as well as building muscle and suppressing appetite. These include improving memory, helping the body better control blood sugar levels and cleaning up the damage from free radical molecules that can accumulate in cells and lead to cancer and other diseases. ‘Substantial observational evidence exists for the beneficial effects of the intake of food and drink rich in sirtuin activators in decreasing risks of chronic disease,’ said Professor Frank Hu, an expert in nutrition and epidemiology at Harvard University in a recent article in the journal Advances In Nutrition. Although sirtuin activators are found all through the plant kingdom, only certain fruits and vegetables have large enough amounts to count as sirtfoods. Examples include green tea, cocoa powder, the Indian spice turmeric, kale, onions and parsley. Many of the fruit and vegetables on display in supermarkets, such as tomatoes, avocados, bananas, lettuce, kiwis, carrots and cucumber, are actually rather low in sirtuin activators. This doesn’t mean that they aren’t worth eating, though, as they provide lots of other benefits. The beauty of eating a diet packed with sirtfoods is that it’s far more flexible than other diets. You could simply eat healthily adding some sirtfoods on top. Or you could have them in a concentrated way as Jadis did. Adding sirtfoods to the 5:2 diet could allow more calories on the low-calorie days. Sirtuin activators are very new to the science of nutrition. Vitamins were discovered more than 100 years ago, antioxidants 50 years ago and sirtuin activators just over ten years ago. The first sirtuin activator identified – and still the best known – was resveratrol, found in the skin of red grapes (which is why red wine is said to keep you healthy), pomegranates and Japanese knotweed. Other sirtuin activators soon followed, such as catechins (found in green tea and thought to work against cancer cells) and epicatechins in cocoa powder (responsible for the health benefits claimed for dark chocolate). But research really took off when the pharmaceutical giant GlaxoSmithKline bought the rights to produce synthetic versions of resveratrol for £462 million. It excitedly trialled this as a cancer treatment but the results were not impressive. Furthermore, participants were plagued by side-effects, including nausea, vomiting, diarrhoea and, in some rarer cases, kidney failure. In 2010 the company announced that it had stopped researching it. But it seems eating foods naturally rich in sirtuin activators may be a healthier, more effective – and cheaper – alternative to supplements. That was the thinking behind the trial of the sirtuin-activator diet that Jadis took part in. The trial was run by Aidan Goggins, a pharmacologist who specialises in nutritional medicine at the University of Surrey, and Glen Matten, who has a masters degree in nutritional medicine. In 2012 they’d published a searing critique of the supplement industry, The Health Delusion, in which they revealed how millions of us are taking vitamin pills we don’t actually need but which can, in some cases, be positively unhealthy because they provide much higher doses of nutrients than are found in our food. More recently the pair have been researching the benefits of sirtfoods and believe these hold the secret to a radical new approach to weight loss and healthy eating. Last year they had what they describe as a Eureka moment. LESS LIKELY TO PILE WEIGHT BACK ON? Sirtfoods also seem to offer a way out of the calorie control trap, in which all the weight piles back on when you start eating normally again. Turning on the sirtuin genes encourages your body to burn fat and to use any excess glucose to power muscle-building rather than shunting it into storage as fat, according to a study by physiologists at York University in Toronto, published in the Exercise and Sports Sciences Review in 2013. So once you’ve started including sirtuin activators in your diet, it make sense to make them a regular part of it. Goggins and Matten decided to put their theory to the test at the KX Health Club in Chelsea. They devised an eating programme that concentrated on high sirtuin activators. They started with 37 club members, 15 of whom were overweight, while 22 – including Jadis – had a normal Body Mass Index (BMI). More than 60 members have now followed the diet. 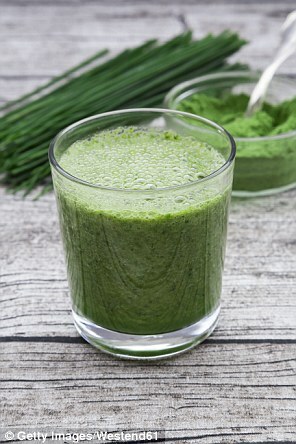 For the first three days the participants had 1,000 calories a day, largely from sirtfoods – this came in the form of three green juice drinks (see a sample recipe below left) plus one balanced meal. 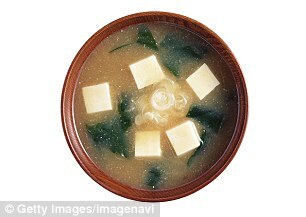 The meal could be a starter of miso soup, followed by a salad with turkey (for the protein), rocket, kale, watercress and olives with lemon dressing and buckwheat. By the fourth day and for the rest of the week they had 1,500 calories a day from two juice drinks and two balanced meals. The volunteers had all been doing a fairly moderate amount of exercise. None increased it and some, interestingly, actually started doing less. Even so, they lost an average of 6½ lb (3kg) of fat but put on nearly 2lb (0.8kg) of muscle, which meant in total they lost on the scales on average 4lb 7oz. As well as the fat loss and muscle gain, all participants showed a rapid improvement in the levels of both the sugar and fat levels in their blood. 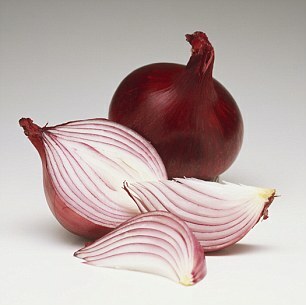 The trial being run by Goggins and Matten is very different from the way sirtuin activators have been treated by other researchers, who have generally focused on a single plant and usually just one of its ‘activators’ such as resveratrol in red grapes, and quercetin (which may help to control glucose levels in the blood) in onions and apples. Combining ten or more sirtfoods in their natural form is a radical change. Human trials using a single sirtfood have reported promising results. Last October researchers at Columbia University in New York reported that cocoa was able to wind back the clock and improve memory. 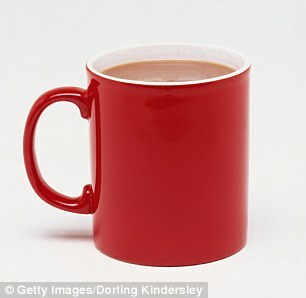 Drinking nearly a litre of milk or water a day for three months with a gram of cocoa – especially rich in the sirtuin activator epicatechin – dissolved in it, gave the 19 middle-aged people the memory of someone 30 years younger, according to Nature Neuroscience. Then in November researchers at Monash University in Melbourne reported that when patients with early type 2 diabetes had a gram of turmeric (the spice used in curries) a day, it improved their working memory. It seems there’s no doubt that a single sirtfood, given in fairly high doses, can have a beneficial effect. But there are drawbacks. ‘Isolating them – or taking them in pill form – involves much higher doses than you’d get naturally, making the results unpredictable and so less easy for the body to use,’ says Mr Goggins. More importantly you miss out on the combined effect of different activators in sirtfoods working together. Whizz the ingredients together in a food processor until it is a liquid. Mix in half teaspoon of matcha (green tea powder) and add apple juice to taste. 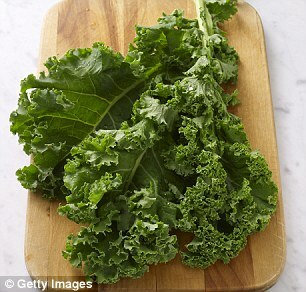 ‘We tend to talk about one activator in connection with one food: red grapes have resveratrol; kale and broccoli both have one called kaempferol. But all sirtfoods contain many activators, each having different effects. We are just beginning to understand how they all work together,’ he explains. This combination is almost certainly behind the well-established benefits of the Mediterranean diet, which is rich in sirtfoods such as olives, olive oil, red wine and onions. Last December the BMJ reported that a study with more than 4,500 women found that those who ate a Mediterranean diet were likely to have longer telomeres – the protective caps at the end of our strings of DNA which are linked with living longer. To boost the effects further, researchers at the Institute of Human Nutrition and Food Sciences at the University of Kiel in Germany suggested combining the most effective elements of the Mediterranean diet with the Asian one. 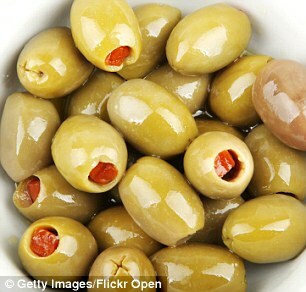 That way you could get the benefits of the activating compounds in olive oil and red wine along with soy and green tea. ‘This would shift the metabolism away from using glucose as an energy source, bring down cholesterol and make the lining on the blood vessels more flexible – both known effects of several of the sirtuin activators,’ said Professor Gerald Rimbach, a director at the institute. One of those who says she’s benefited from switching to sirtfoods is Lorraine Pascale, the former top model and now TV chef and food writer. Since boosting her intake of sirtfoods, she’s ‘had an increase in energy and lean muscle mass’, she told Good Health. She is now working with Goggins and Matten on a new book due out in the autumn, showing how to cook ‘simple tasty easy family food which also happens to be healthy’. The science around sirtfoods is very new and more research and clinical trials are needed, but already the benefits look impressive.